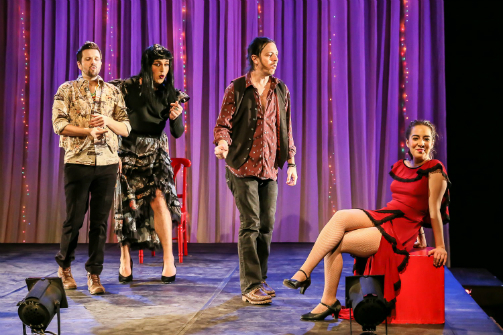 John J. Concado, Michael Domitrovich, Robert Boston, and Heather Velazquez in Rosario and the Gypsies. Photo by Lee Wexler/Images for Innovation. BOTTOM LINE: This newly revised, expanded, and musicalized version of Eduardo Machado’s 1982 play with music is proof that more is not always better. The times they are a-changin’, but that shouldn’t mean that we have to take that change sitting down. This is the impulse behind Rosario and the Gypsies, Eduardo Machado’s musical about a group of avant-garde street performers struggling to maintain their proclivities for love, creation, and justice in a Reagan-led America of the 1980s. Charismatic flamenco dancer Rosario (Heather Velazquez) is still reveling in the free love and liberalism of 1960s America and, together with her eclectic group of friends, is content to spread her messages of performance and peace throughout the streets of San Diego. But when a new America is born under the hand of Ronald Reagan, Rosario and her friends are forced to reevaluate their dedication to their politics, their art, and each other. Originally conceived and performed as a one-act play with music in 1982, Machado has revisited, revised, and expanded his piece into a full-length, two-act musical, bringing new insight and new conclusions into the lives of Rosario and her Gypsies. While I appreciate Machado’s efforts and impulses to continue Rosario’s story, I can’t help but wonder if such an expansion was truly beneficial. Compared to Rosario’s first act, an enchanting and invigorating exploration of the personal and political clashes happening both on and off of Rosario’s stage, the show’s second act, set several years later, feels overlong and lackluster. Yes, it answers some questions about the various directions Rosario and her posse took throughout the 1980s, but it contributes relatively little new insight into the musical’s overall arguments regarding the relationship between creativity, rebellion, and American politics. I do, however, applaud Machado for his decision to transform the piece into a full-out musical, as its moments of uninhibited song and dance are those in which life flows most freely from the stage. Rick Vartorella’s music, described as “a combination of street pop and 60s-70s rock,” is beautifully realized by an acoustic band and the vocals of a talented ensemble (most notably in Velazquez’s Rosario and Gizel Jimenez’s flirtatious Mary), and pairs nicely with Crystal Field’s appropriately offbeat choreography. Also noteworthy is Mark Marcante’s scenic design, which is simply rustic yet entirely effective in suggesting the San Diego plaza in which Rosario and her friends perform, as well as Alexander Bartenieff’s lighting design, which utilizes multitudes of colorful Christmas lights to designate the space as appropriately bohemian. Ultimately, Rosario and the Gypsies presents its audience with a group of fascinating, flawed individuals in an effort to ask important questions about art, idealism, and our political landscape--it’s just a shame that these questions end up buried in Machado’s efforts to incorporate “more” into his work.